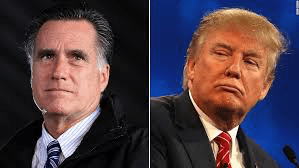 Mitt Romney begins to get calls to run against Trump in 2020 for the Republican Presidential nomination…. With Romney out with comments questioning his parties leader Donald Trump actions? And a government shutdown going on? Some Republicans donors ARE beginning to quietly reach out for SOMEONE to challenge a off the tracks Donald Trump…..
One of incoming Sen. Mitt Romney’s (R-Utah) top political advisers has reportedly been fielding calls from donors urging Romney to consider a 2020 run against President Trump. Spencer Zwick established Romney’s donor network during his two previous presidential campaigns in 2008 and 2012. Zwick routinely takes calls from donors encouraging Romney to challenge Trump for the Republican nomination in 2020, two people familiar with the discussions told The Washington Post. Romney lost the 2008 Republican primary to the late Sen. John McCain(R-Ariz.) and went on to secure the party’s nomination in 2012 before being defeated by incumbent President Obama. Romney has emerged as a vocal critic of the president, penning an op-ed attacking Trump’s character and accusing him of a glaring “shortfall” in policy and leadership…. Incoming Sen. Mitt Romney on Wednesday said he won’t run for president again, though he warned that President Donald Trump doesn’t necessarily have his support for his 2020 reelection campaign. “I think it’s early to make that decision and I want to see what the alternatives are,” Romney told CNN’s Jake Tapper about whether he will endorse Trump in 2020…..